The deadline to apply for the 2018 Scholarship is August 28th. The World Beef Expo Founders Scholarship was established to honor the men and women who, through hard work and foresight started the World Beef Expo. Their vision was instrumental in laying the foundation for its mission. 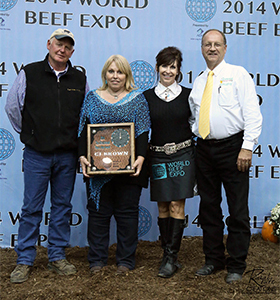 World Beef Expo is proud to honor their contribution toward World Beef Expo’s success. Two scholarships of $1,250.00 will be awarded. The scholarships are sponsored by the Gregg and Angela May and Dave and Marcia DeLong Families. The World Beef Expo Founders Scholarship is available to any student no younger than a high school senior to no older than 21 as of January 1st 2018 and still eligible to show at World Beef Expo. Applicants must be enrolled or planning to enroll in any University, technical college, or community college. Preference will be given to students majoring in an agricultural related field. Applicants must have a background in the beef industry and possess a sincere interest in beef production. Preference may be given to applicants who have shown and participated in World Beef Expo. The Scholarship is open to individuals from any state. The Paul May Award was presented each year to someone who had done an outstanding job of supporting the World Beef Expo. Recipients were selected by the World Beef Expo Board of Directors for their dedication and commitment to making the World Beef Expo a success. The list of recipients include volunteers for a specific project, long term board members, long time breed representatives, and others who have given their time and energy to promote the World Beef Expo. The work of these individuals has greatly contributed to the continued success of this top notch beef show. The Award is named for Paul May who was the first President of the World Beef Expo. He was instrumental in organizing the first shows and his commitment and dedication contributed to the overall success and longevity of the World Beef Expo.